This blog focuses on the world of prospect research and various related fundraising topics. To diversify our subject matter, we like to feature the work of our friends and colleagues in the community. With that said, join me in welcoming Chad Peddicord, the Executive Vice President at Averill Fundraising Solutions. 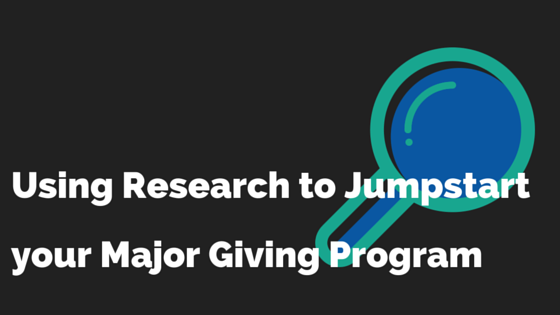 Please enjoy his post on research and major gift programs. The first step for an efficient major gift program is segmenting and prioritizing the donors in the database. Previous major gift donors are obvious – keep them on the priority list. But do a little digging and look for donors that have been consistent over the past 5 years and have increased their giving. This is a signal they believe in what you are doing and might have more capacity. Is there an individual in the database that has made at least one gift annually during the past 5 years and started at $50 and is now at $500? Or maybe their first gift was $500 and now they give $2,500 annually? That’s a clue, and they should be marked as a potential major gift prospect because of their increasing affinity. Affinity alone is not enough to prioritize efficiently. Discovering which donors or prospects have the capacity for a major gift is important. The simplest and most effective way to determine that is through an electronic screening. If done right, the screening will create more work, but it will also narrow the field of donors and prospects that you have to include to create an efficient major gift portfolio. Focus on philanthropic behavior and political giving – data shows these two indicators most accurately reveal major gift capacity and willingness. Once donors and prospects with major gift capacity have been identified through screening, the real work begins. The screening helps to narrow the field, but now research is required to confirm that the screening information matches the person in your database. (If you have very clean data and several components of personal information on each individual prior to the screening – you will save a tremendous amount of time in research and get much better results from the screening.) With more information from research, narrow the major gift pool further and begin to develop individual cultivation and solicitation strategies for each prospect that can then be implemented. The strategy step is where the right people, the right project, the right ask amount, and the appropriate request timing need to be discussed. The real research begins as you have conversations with individuals about exciting projects. Invite potential donors for a tour, or talk to them about the strategic plan, or get their advice on a new idea. This opens the door for discussions on how to accomplish the important mission at hand and the gifts required for success. Nothing can replace the “shoe leather” research and the most helpful information always comes from asking questions and dialogue. These personal conversations then inform the strategy moving forward and determine how to ask for a major gift. In addition to your current donors and prospects, take this opportunity to add new prospects to the list. There is a plethora of ways to find individuals that might be prospects for your organization and this process could be its own blog post. But an easy way is to use a database that catalogues charitable gifts to not-for-profits and will allow a search to find individuals with philanthropic interest and demonstrated giving to “relevant” organizations to your mission. Now that the major gift prospect pipeline is narrowed, each must be assigned to “someone” to manage the relationship. I say “someone” because depending on the size of your professional fundraising staff – “someone” could mean many things. For example, with a small staff, major gift prospects might be assigned to board members or volunteers. And while the professional fundraiser will play a role in the process, the board member might be doing all of the outreach to the prospect and building the relationship. The data is clear, in order to successfully cultivate and solicit a major gift – the prospect has to be managed by someone. The last piece to an effective major gift program is as simple as asking for the gift. If all the above steps have been accomplished, there is nothing left but to ask. Capitalizing on all of the work done to prepare for soliciting major gifts requires creating some activity benchmarks that drive the program. The benchmarks are different for every organization, but they always involve personal visits and requests. Track the activity against your goals and the major gifts will follow. For more information, read our other resources on major gifts or check out the services offered by Averill Fundraising Solutions. Chad Peddicord is the Executive Vice President at Averill Fundraising Solutions, a full-service philanthropic management firm. Chad’s experience includes more than 15 years collaborating, assisting, directing, and providing strategic guidance to not-for-profits. His work with arts and cultural, civic, environmental, educational, healthcare, human service, and faith-based organizations has produced nearly $1,000,000,000 in philanthropic support.